For the last few weeks here in Upstate NY it’s seemed like Groundhog Day. I launch my boat and get the same number of bites in the same spot everyday. On a normal year there’s countless spots I could fish, but this fall I’m pinned to one tiny section because there’s absolutely no water up here. On a typical year the Oswego averages 3,500 cfs during salmon season. This year, meanwhile 800-1,200 is what we have. We need two to three inches of rain to bring the river back to historical salmon season levels. For those of you who are familiar with the Oswego the power plant is shut off and there’s only a little flow coming in from the dam. Did I mention we need rain? Each day, I’m forced to fish the same two current seams. Normally, when there’s flow there’s dozens of seams and endless places to fish. Fortunately, my methods haven’t changed. On the other hand, I’m not using any plugs this year as there’s not enough flow to warrant it. From a drift boat, without fishing eggs you can’t really fish. Even the guys from the bank are being forced to use eggs, partially because the game wardens are out in force this year trying to curtail snagging. In spite of the low water the bites continue to come. The river isn’t plugged full of fish. I’d say we have fewer than normal in the river, but we are still catching limits each trip and running two trips a day. 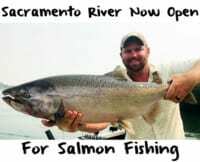 (Limit is 3 salmon per angler). 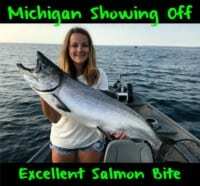 We are seeing the salmon average 18-20 pounds, but caught them to 33 pounds. There’s about three weeks left in our season and I’m expecting lots of fresh fish to come in as soon as we get more water, some water, any water. If we don’t get anymore rain those fish will come slowly and just trickle in, but if we get a nice rain the river will plugged the next day. Without cured eggs I’d be in deep trouble. Right now, I’m catching them in dead, slow water and cured egg has been the only thing they are biting. It’s working great. 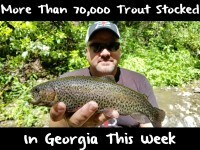 We are catching browns, steelhead and rainbows on the cure. Surprisingly, I’ve gone through almost as many cured eggs this season as I did all last year, but that’s because of the low water. Almost my entire arsenal is pink Pautzke FireCure eggs. I use 80 percent pink FireCure and do some in natural and red, too, but most of the bites are coming on the pink. When using roe I’m not using as big chunks of roe as I have in the past. I’m using a No. 2 hook and a quarter-size chunk where normally I run chunks the size of silver dollar with a size one hook. Basically, the low water has forced us to downsize. Fishing is repetitive. Every day, for my morning and evening trips, I’m anchored and using slip floats, running 8-12 feet under the float and fishing right at the power station. People see me in the same spot all day. All we have to do is drop the eggs off the front of the boat and let it go downstream. On a normal year I’d back troll first thing in the morning. Then when it got brighter I’d egg fish. And, then in the evening I’d back troll the last two hours. But, now all I can do is run eggs. All I’m using is eggs and I’m going to through at least a gallon Ziploc a day.